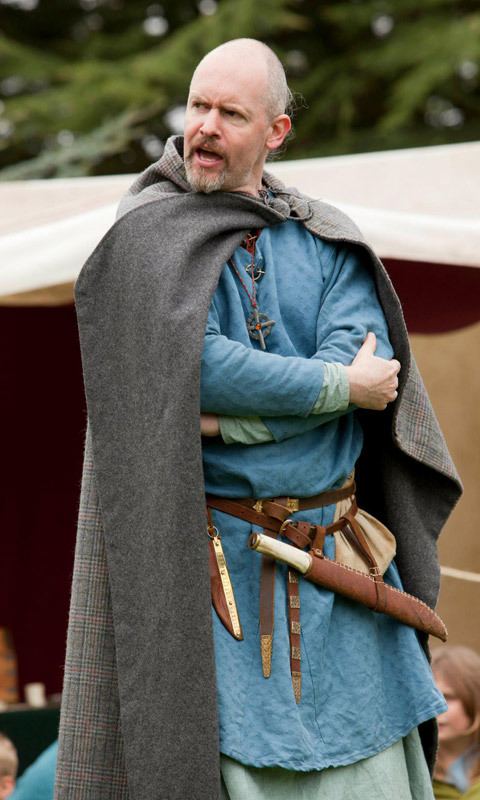 What do we know about Viking clothes? Textiles seldom survive in the earth when buried for a 1000 years, but archaeologists do finds fragments of textiles, mostly adhered to a metal brooch or buckle. Sometimes complete, or almost complete garments are found, usually where the soil is favourable to the longevity of the fibres, such as in bogs. These fragments help us piece together what the clothes looked like, what they were made of and how fine they were. Occasionally we can even find out what colour they were dyed. We can also get an idea about what clothes looked like from art work; painted manuscripts, engravings, carvings and embroideries can give clues to the fit and finish of a garment. Some people in the Viking-Age also wrote about what they wore in stories such as the Viking Saga's, or we can find out information from wills and legal documents where precious clothing has been passed down after a death in the family. However, we have to be careful when looking at art, or in literature as they could be exaggerating or making things up to impress their audience. 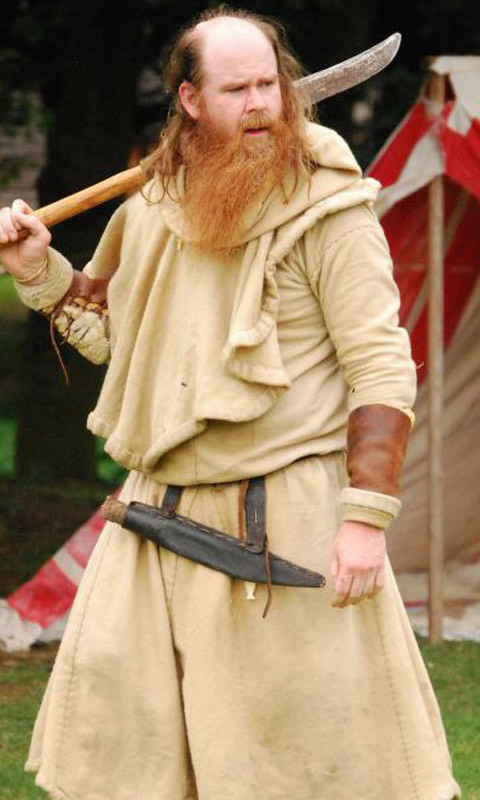 What we do know is that the people of the Viking Age wore simple, tight-fitting clothes. 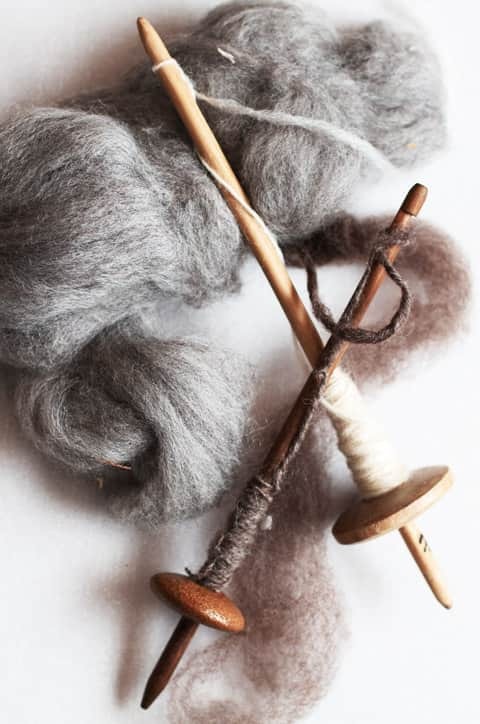 As it is quite cold in Northern Europe, clothes were mostly made out of wool which was often spun at home in a twill weave or sometimes bought from a weaver in the budding market-towns. Many people kept livestock such as sheep and traded their fleeces. White sheep were the most prized as their fleeces could be dyed with natural pigments extracted from plants such as madder, woad and lichen. Clothes could also be made from linen grown and then woven from the fibres of flax, and occasionally hemp. Linen is a hard-wearing but quite soft fabric and might have been best used for under-clothes, bedding, or as a lining to a more elaborate garment. Most linens would have been plain and undyed, but perhaps bleached with wood ash and boiling water. Silk textiles have also been found. Silk would have been a precious commodity - it was almost as expensive gram for gram as silver. 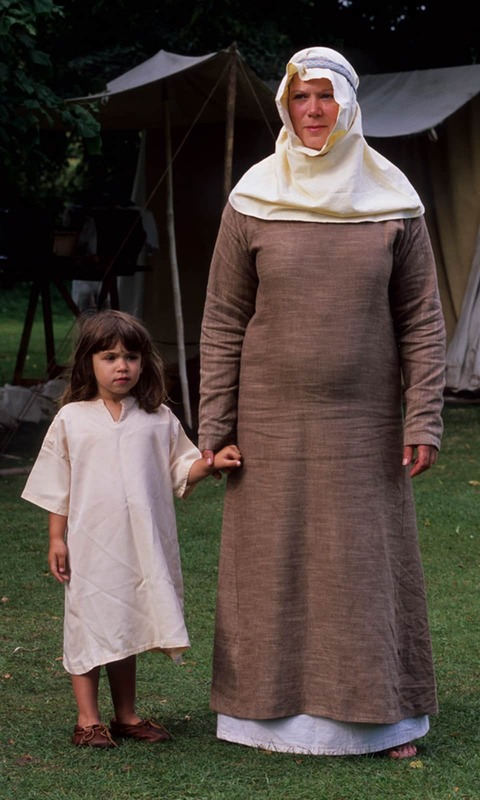 One of the most common silk garments are women's head coverings, but the fibres have also been found in high status burials used for coats and braid. The women of a household would be primarily responsible for spinning the yarn from fibres, weaving the fabric (perhaps on a 'warp-weighted loom') and then sewing the garment. Most families would make their own clothes in this way. Spindle whorls are a common find in archaeological excavations. Many are made from bone, wood or clay. They'd be mounted on a wooden rod and the fleece would be drawn into thin strands as it was spun. Once the yarn was made, it could be dyed straight away, or woven into fabric on a loom. The yarns were secured in two directions: warp and weft. The weft thread would be woven under and over the warp thread with a shuttle, and the yarn would then be beaten to keep it straight and neat. For large fabrics like sail-cloth, beaters were sword-sized pieces of iron! Sewing needles look very similar to the kind you can buy today, but they were often much thicker and made of materials such as fish bones, iron or copper. While home dying may have occurred, the amount of dyestuff required to get a solid colour may have been too costly for most folk. Most dyed garments were probably 'washed out' with pale earthy shades. In larger urban centres such as Jorvik, dying would have been a professional occupation, and yarns would be dyed with a variety of natural dyes, fixed with expensive mordants. Madder, which produces red, was common in Anglo-Saxon dye-works. What other uses were there for fabric? 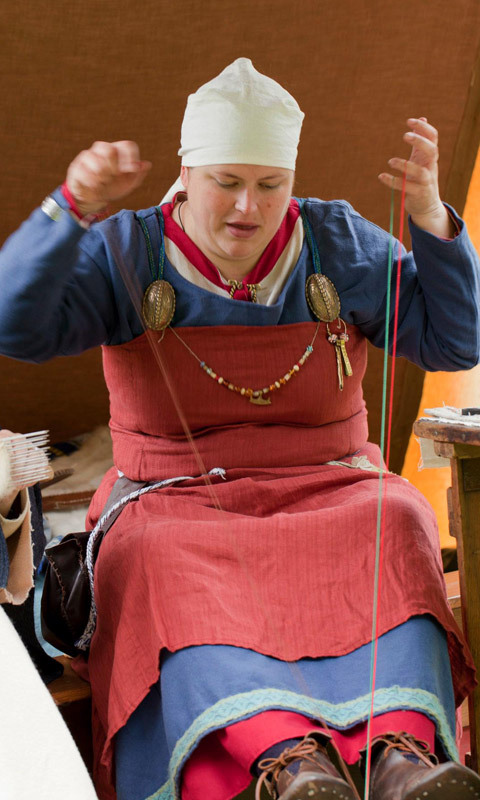 In addition to making decorative braids (with techniques such as tablet weaving), and embroideries, Viking-Age people also made domestic items such as sacking for grain and other commodities, and sails. Linen may have been used to transport food, herbs and spices in small bags and pouches. Leather was also an important material in the Viking Age since it was both tough and, if properly treated, fairly waterproof. It was used for all sorts of everyday items such as shoes, belts and pouches, as well as for scabbards for swords and knives, and possibly clothes. Leather items, and evidence of leather workshops, have been found in the excavations of a number of Viking-Age towns. It may also have been used as a cheaper and lighter alternative to metal armour. Soaking leather in hot melted beeswax and then drying it makes the leather extremely hard, and able to resist glancing blows from weapons quite effectively. Although there is no firm evidence for the use of this sort of leather armour by the Vikings, the technique was used both before and after this period, and some archaeologists and historians now think it likely that the Vikings used it as well. Leather items were often plain and functional, but they could also be highly decorated. An attractive raised effect could be obtained by carving a design into wet leather with a sharp knife, then working round the knife marks with punches. Male clothing consisted of a simple knee-length woollen top called a kyrtle. This garment would be brought in at the waist with a leather belt that could hang useful items such as a knife. Men might have worn a pair of short woollen breeches worn with hoses, or longer trousers, almost certainly tightly fitted at the calf and ankle so they could be worn with leg wraps or 'winingas' that would protect the bottom of the trousers from thistles and other detritus that they might stumble upon whilst working in the fields. Shoes or ankle boots of leather have also been discovered, often made from one piece with a sole stitched on, and fastened with a toggle made of bone or wood. When travelling, or in the winter, a long, thick woollen cloak or mantle would be worn, fastened with a pin or brooch. Unlike today's clothes, a hood was a sperate item - again made in wool. These would be very tight around the head so that they wouldn't blow down in the wind. In the summer, it is possible people wore smaller hats of wool, or even a wide-brimmed hat made of straw. Richer people would wear similar clothes, but they could have been dyed a bright colour, and may have been made of finer, tightly-woven fabrics in complex weaving patterns. Some 'kyrtles' would have panels or gores in the skirt to make it much wider, showing off the amount of extra fabric and colours that they could afford. At court, the king and his eldermen are depicted in art wearing long gowns of bright colours, decorated with braid or embroidery at the sleeves and hems. Jewellery was also worn. Pendants, elaborate belt fittings, bracelets, twisted-wire arm rings and finger-rings have all been discovered. Poorer people seem to have copied the fashions of the rich and famous using materials such as clay, wood and bone rather than precious metals and stones. Female clothing included a close-fitting,long wollen gown that would hang to the ankles. Unlike male clothing, it is rare to find evidence of a belt, and it is suggested that either women simply didn't wear one, or that it may have been a simple woven band. Just like their male contemporaries, leather shoes were worn, as was head gear. A simple head scarf, hood or wimple made of linen seemed to be common, especially amongst Christian women. Occasionally, the wimple would be fastened with a fillet - a woven band - or with pins made of bone (and in richer contexts, metal). There are several finds of silk hoods, especially in Dublin, which alludes to the importance of this item of clothing. It's quite likely that women wore their hair long, or in braids; there's also some evidence of married women tying their hair into a knot, anchored with a pin. 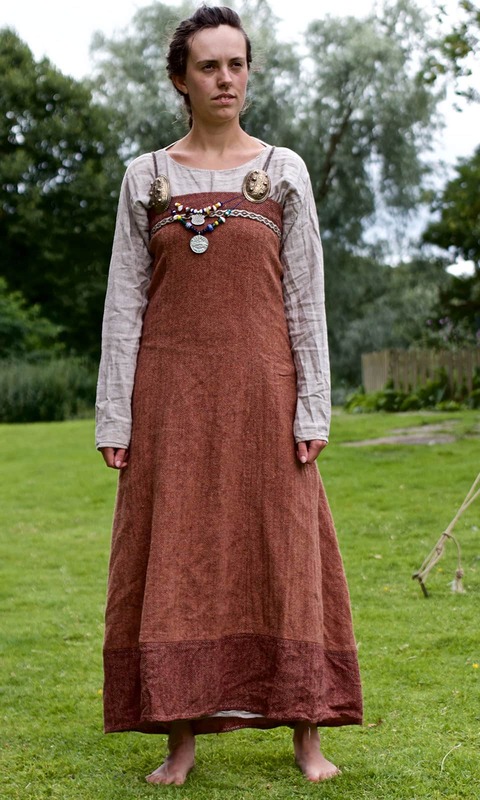 Some Scandinavian women wore a unique dress called a 'hangerok' or suspended dress. There is much discussion between academics about what this garment looked like: was it a decorative overdress, or was it an important accessory like an apron? What is clear is that it was suspended with two brooches at the shoulders where hung a string which could hang useful items such as a chatelaine set (often with a tooth pick, tweezers and ear spoon), knife or shears. Richer finds see glass beads and silver pendants. Pagan grave finds in Scandinavia see a plethora of jewellery and accessories, far more so than in male graves. Glass beads, amber and other precious stones and silver all appear in one form or another. In one grave in Birka (Sweden) there was 136 beads, mostly on one necklace! It is likely that women wore similar travel cloaks as men, but there are depictions in art of large cowls which may have been worn as an alternative. Just like male clothing, wool was the predominate fabric, but richer people would show off their wealth with exotic silks and colours made from expensive dyestuffs. Tablet or Card weaving is one of the oldest known weaving techniques, traceable back to at least the early Iron Age. The woven braid produced was used to decorate clothing as a trim, or to cover seams and it's possible the braid was used as belts or girdles for women. The tablets or cards used are small flat squares, usually of wood but bone and metal tablets have also been found. The tablets have a hole in each corner through which a thread, wool, linen or silk, known as the warp is threaded. 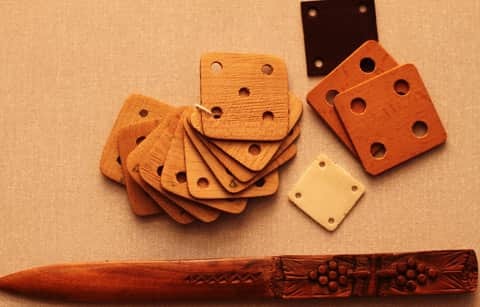 The tablets are held in the hand similar to a pack of cards, laying parallel to the warp threads, and are then turned backward or forward by half or quarter turns. This action twists the four threads into a single strand, which is then held in place by the weft thread, which has been passed between the warp as it turns. By varying what colour of the warp yarn is used and the directions in which the tablets are turned, intricate warp patterns can be created these patterns are called 'threaded in' patterns. The weaving can be done on either a frame or can be fastened to a belt and a post. 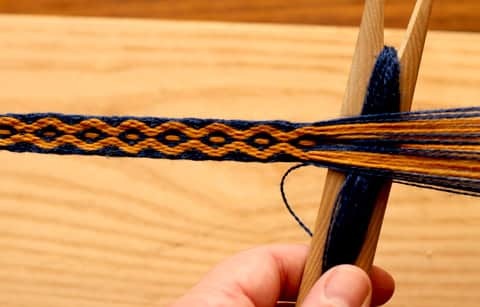 A technique called 'brocading' could further be used to enhance tablet weaving. This was achieved by using a second weft thread, which runs over some or all of the warp threads, creating a pattern on the surface of the thread. Brocaded tablet-weaves were usually of silk, using gold or silver thread for the brocaded pattern. This type of tablet weave was very expensive and as such would be used to decorate expensive garments worn by the incredibly rich. A further method of tablet weaving used was the double face technique with this method the cards are threaded with only two colours and is used to produce lettering and patterns which are the same on each side but with the colours reversed.